The 2016 SCGA Championship season is officially underway and a familiar name finds itself atop the leader board at the 14th Annual Foursomes Championship at Dove Canyon GC. 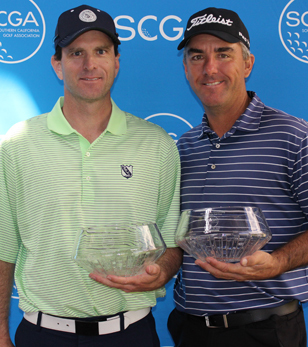 Last year's SCGA Amateur Champion and Player of the Year Nathan Celusta paired with Jason Pridmore to shoot a 1-under 70 in the final round to seal a 3-shot victory. Playing in an alternate shot format, the duo carded a first round 2-under 69 and held a 1-shot lead overnight. On the final day, the pair came out strong with two birdies in the first six holes before stumbling and bogeying the final two holes of the front nine. However, they were able to steady the ship, birdying No. 11 and paring the final seven holes for a slice of redemption at the Foursomes Championship, finishing with a two-day total of 3-under par. Pridmore, an SCGA regular, felt the same after securing his first SCGA Championship. Both parties of the winning duo plan to play in numerous SCGA Championships this season. Pridmore echoed much of the same. Mark Scheibach and Scott Stevens pulled into second place with a second round 2-under 69 for a final score of even par while the combo of Sonny Nimkhum and Ryan Panichpakdee came in third place with a total of 3-over.